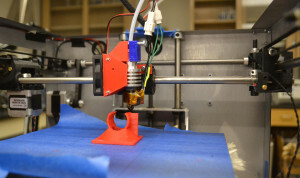 Many agencies have tried to create a device that will help with the picking process – a machine that is both gentle enough and picks fast enough to make it economically viable for commercial use – but have been unable to do so. 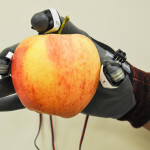 Engineers and scientists at Washington State University Tri-Cities and the WSU Center for Precision and Automatic Agricultural Systems (CPAAS) are creating a practically adoptable robot that will pick apples as efficiently as people. The U.S. Department of Agriculture awarded a research team from WSU a $548,000 grant in 2013 as part of its National Robotics Initiative. 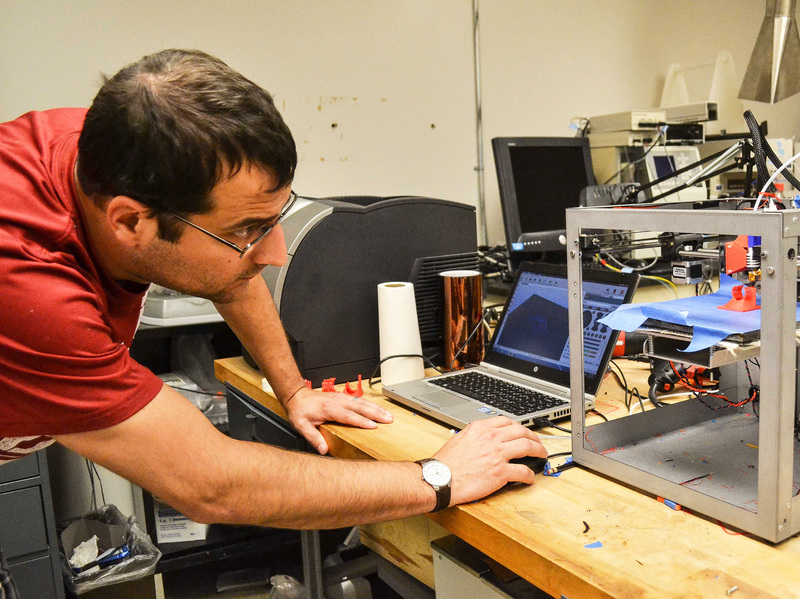 The team hopes to test a working prototype as early as this fall in an orchard in Prosser, Wash.
Cameron Hohimer, doctoral student at WSU Tri-Cities, examines the work of the 3D printer as it makes a part for the apple-picking robot prototype. Unlike in factories and other industrial applications, apples require a system that is delicate enough to pick the fruit without bruising it, while also maneuvering around tree branches, leaves and other obstructions, said Manoj Karkee, principal investigator on the project and WSU assistant professor of biological systems engineering. 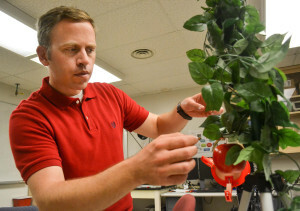 Karkee said he believes he and his team have taken a unique approach compared with others who have investigated robotic apple-picking. Karkee is working with project co-investigators Qin Zhang, CPAAS director, and Karen Lewis, WSU regional tree fruit specialist, to approximate how the robot should move and manipulate to be most efficient and cause the least damage to the fruit and tree. 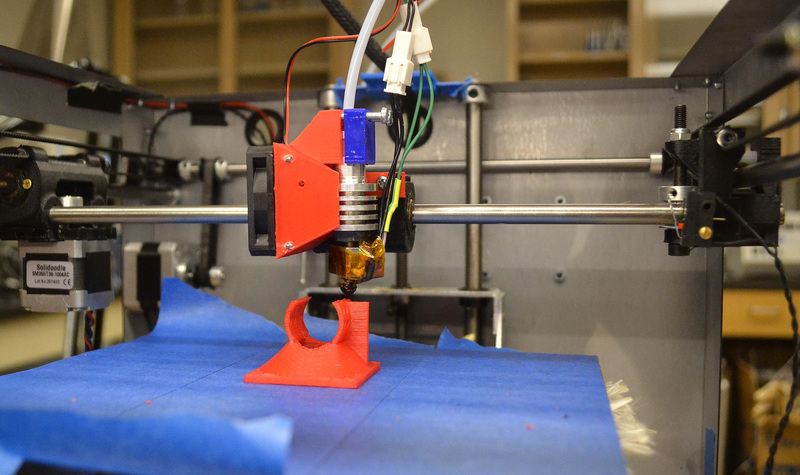 A 3D printer makes a part for an apple-picking robot. 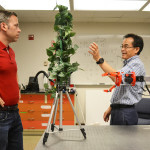 Working with Changki Mo, assistant professor of mechanical engineering at WSU Tri-Cities, the team is focusing on the complementary nature of robots and humans to complete the apple-picking system. 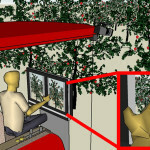 The robot features an arm and “hand” in which eight motors operate in congruence with a vision system to delicately grasp and twist the fruit off the tree as a human does. The robot’s vision system incorporates cameras and sensors to capture an image of the tree. Using algorithms to identify color, shape and texture, it differentiates fruit from the rest of the plant and determines fruit location so the robotic arm can be directed for picking. Karkee said he is pleased with the progress and is optimistic about the team’s prototype that could be used for commercialization in the near future. He said if they succeed in creating an apple-picking robot, it could potentially save growers millions in Washington’s multibillion dollar apple industry.